Today, the birth control pill is a common feature of American life. 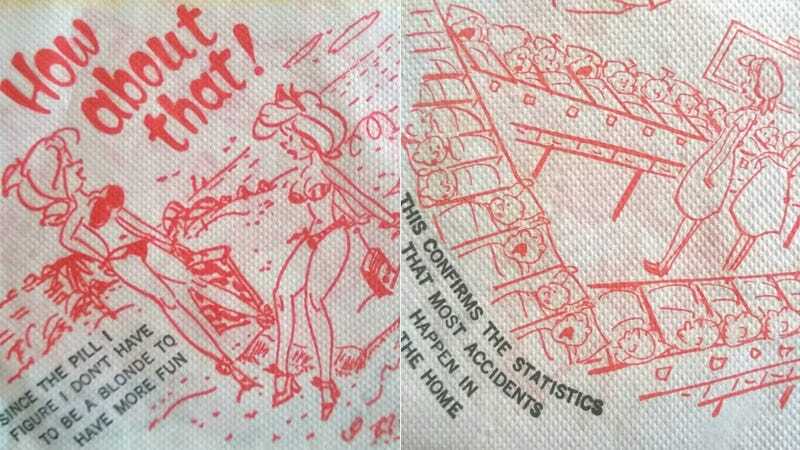 But not so long ago, it was sufficiently newfangled as to make a punchline on this novelty cocktail napkin. These photos come via a Jezebel reader freshly returned from an estate sale, where she picked up a big box of ephemera. (I cannot recommend big boxes of ephemera highly enough.) Included was this cocktail napkin, covered in 360 degrees of risqué jokes. There’s no date, but we can guesstimate—obviously the Pill was on the market but not the widespread utilitarian staple it is today, so perhaps the mid to late 1960s? It goes heavy on the bubbly, booby bimbo jokes, too. The label says this is the work of “Napkins of Distinction by Beach Products,” out of Kalamazoo, Michigan. Some poking around suggests that Beach Products (which eventually evolved into DesignWare) made paper products and party supplies. Their wares from the period pop up on Ebay and elsewhere every so often—this Flickr suggests they offered a full range of jokey titillating napkins. Got any similarly entertaining ephemera knocking around your house? Please do share.